On November 29th, 1913, the Chicago Daily Tribune reported on a special dinner banquet that had invited “every known Japanese resident in the city” and was held at the First Baptist Church in Chicago. With approximately two hundred Japanese residents in attendance, this welcoming event for anxious newcomers had a specially appointed toastmaster in the form of Misaki Shimadzu, a former minister of the church. Calling “the guests to their feet in appreciation of the hospitality that had been shown them, he called forth for three festive banzai cheers from the assembled attendees. The shouts echoed in the main room where a huge painting of Fuji-san, the “sacred” mountain of Japan, was hung prominently at the center of the wall. The festivities continued with all the Japanese in the room joining in an Americanized version of the Japanese national anthem, the kimigayo. Dr. Ernest DeWitt Burton, a prominent biblical scholar who would later serve as President of the University of Chicago, saluted Imperial Japan, proclaiming that “Japan is the only nation in the Orient. . . . A unit bound by the ties of patriotism and love for the emperor.” Butler’s comments suggest that, at least in the 1910s, the strong ties between the Japanese community and the Japanese Empire did not bother many Chicagoans; rather, their patriotism to their motherland and Japan’s diplomatic advancement in the Far East was perceived somewhat positively. Such views of Japanese as both desirable immigrants, and respectable subjects of the imperial nation continued to appear in the Chicago’s press in large part due to the work facilitated by the first major organization for Japanese in Chicago, known as the Japanese Young Men’s Christian Institute (JYMCI). 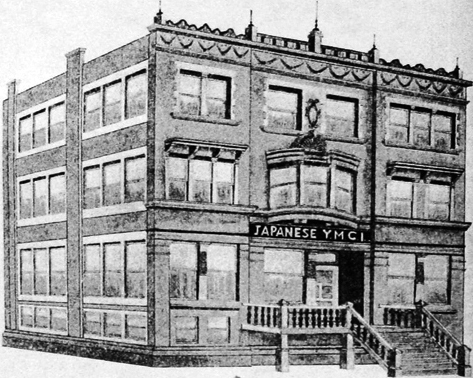 Founded in 1907 by Reverend Misaki Shimadzu, the JYMCI supported the Japanese of Chicago in multiple ways, while reaching out to the larger community around them. With its headquarters open to Japanese residents, travelers, students, and businessmen the JYMCI managed to maintain what the Chicago Daily Tribune had once referred to as “Yamato-damashii”—strong ties with Imperial Japan as well as a vital network among Japanese residents. In considering this time period, how many Japanese were in Chicago at that time? 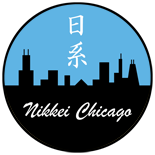 Though the exact size of the Japanese community is difficult to determine, in 1908, the Japanese government claimed that there were 530 Japanese in Chicago, including 455 males and 75 females. In general, the community seemed to be fairly stable in size between 1900 and 1940, generally ranging from 400 to 600 residents. The U.S. census suggests that the Japanese population was spread out across wards, with most living in the area from North Michigan to South of the Loop. Within each ward, there is no evidence that these immigrants resided in close proximity to one another. Images of Japanese immigrants before and after Americanization. 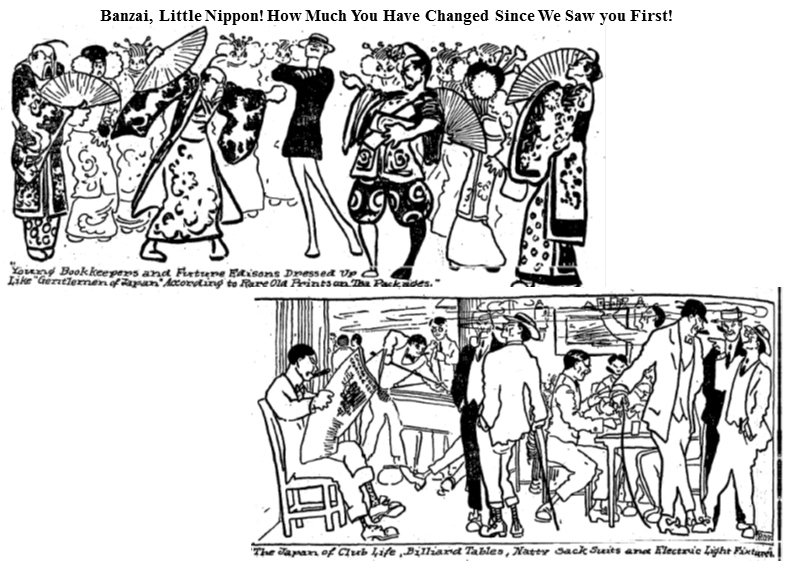 The image for the top caption reads “Young bookkeepers and future Edisons dressed up like gentlemen of Japan according to rare old prints on the packages.” The bottom caption reads “The Japan of club life, billiard tables, natty sack suits, and electric light fixtures.” Chicago Daily Tribune, May 14, 1911, page 12. Thus, the JYMCI became an important haven for this dispersed, and largely male immigrant population. Its founder, the Reverend Shimadzu, had been born in Japan and raised by Buddhist parents before converting to Christianity as a young man. He seems to have come to the U.S. in search of more education but almost immediately became involved in the JYMCI. Under his leadership, the JYMCI defined its mission more broadly than the conversion of fellow Japanese to Christianity. It also served any Japanese person who visited or lived in the city by providing material support, leisure, and religious activities. “Founding of the Japanese Mutual Aid Society of Chicago” addressed to Jutaro Komura, Japanese Minister of Foreign Affairs, by Kaoru Yamazaki, Consul General of Chicago. Diplomatic Archives (Office of Diplomatic Records of the Ministry of Foreign Affairs of Japan). One of Shimadzu’s most important initiatives included the founding of the first Japanese Mutual Aid Society of Chicago in 1910. According to then-Japanese Consul Kaoru Yamasaki, this Japanese Mutual Aid Society had been established in case of “financial turmoil, for sudden illness, or other emergencies of Japanese immigrants.” As of December 27, 1910, a total of 119 Japanese were members of the Japanese Mutual Aid Society, for which Shimadzu served as a sub-accountant. In a city without Buddhist temples or prefectural associations, the JYMCI became particularly important. 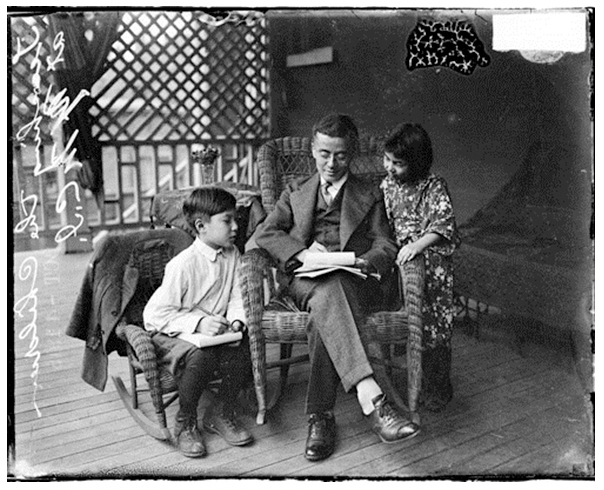 In 1911, Shimadzu managed to put the JYMCI on solid footing by affiliating himself officially with the Chicago YMCA where he was hired to serve as its “Japanese secretary.” He was the only non-white officer in the collection of portrait photos published in the YMCA’s official annual report. 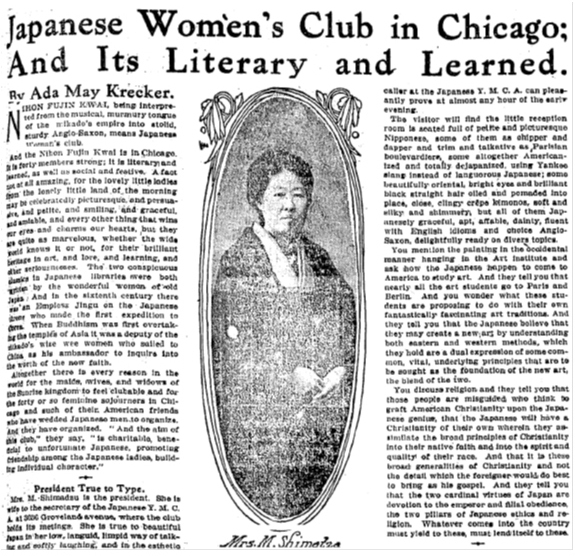 Article featuring a picture of Yone Shimadzu, from the Chicago Daily Tribune, May 7, 1911, 15. 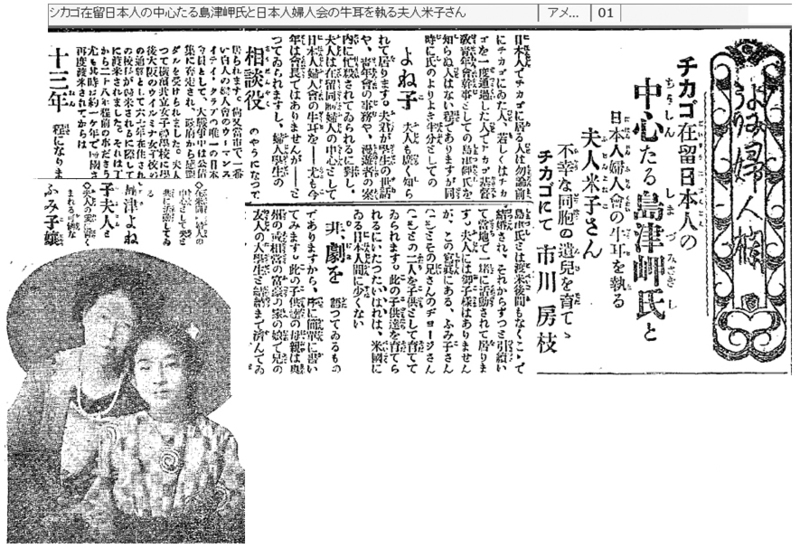 In January 1922, Mrs. Shimadzu was featured in an article in the Yomiuri Shimbun, published in Japan. It features a picture of Mrs. Shimadzu and her adopted daughter, and describes her as “the leader of Chicago’s Japanese Women’s Club, and the only Japanese member of the Women’s City Club of Chicago. Yomiuri Shimbun, morning edition, January 25, 1922, page 4. As Yone Shimadzu suggested to the reporter, Japanese women were neither simply transforming themselves into Americans nor focused exclusively on spreading the Christian gospel to the members of the community. While they learned how to speak and behave in American society, they continued to use their native language and preserve their heritage. Yes, they were Christians like many other Americans in the society but their “Christianity” was strongly tied to their mother country and their sovereign. 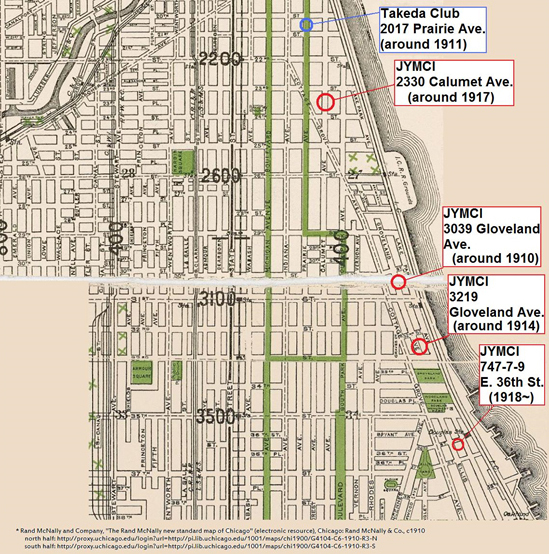 Based on the information that appeared in the Chicago Daily Tribune, “The Japanese Student” journal, and Shimadzu’s Diary, these are the locations of the JYMCI and a Japanese social club. Although the JYMCI moved three times, all the addresses were in the Douglas neighborhood, south of the Loop. With support from Chicago religious leaders, the JYMCI began to grow. 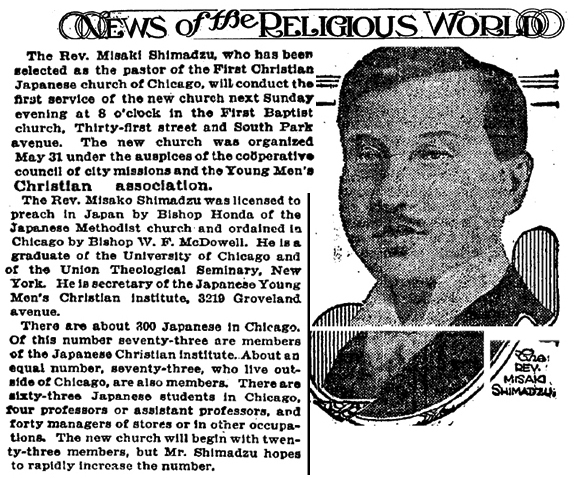 When the institute moved in 1914, the Chicago Daily Tribune wrote about Shimadzu that he was “licensed to preach in Japan, [and] also had attended, albeit briefly, the University of Chicago and the Union Theological Seminary.” He talked to the reporter of his plans to increase membership as the pastor of the first Japanese Christian Church of Chicago, which had been organized in 1914 and reportedly had seventy three members inside Chicago and the same number of members outside the city at that time. According to Shimadzu’s monthly reports to the YMCA in March, 1915, the JYMCI had weekly Sunday meetings where Japanese students, visiting scholars, and rectors, including Shimadzu himself, preached to an audience of twenty six to thirty-five attendees. Tuesday evening meetings and Thursday night prayer meetings usually attracted ten to twenty Japanese young men. 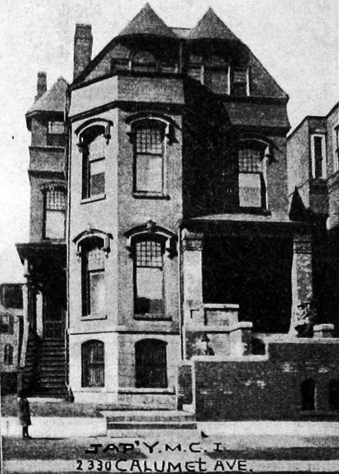 A biweekly volunteer mobilized JYMCI members for the “Evangelization of Chicago Japanese.” At one meeting, a map of Chicago was drawn to assign a specific section of the city to thirteen attendees, who were willing to work to proselytize Japanese living in the city, and at another meeting, twenty seven of both men and women attended for these activities. In addition, the institute sometimes held special weekday lectures, which included a music program provided by “girl students” of the Chicago Training School, and a discussion with veterans of the Russo-Japanese War. JYMCI building rented around 1917 at 2230 Calumet Avenue. From the article “Our Service to the Japanese Students,” by Misaki Shimadzu, in The Japanese Student, February 1917, (Chicago: George Banta Publishing Company, 1919), 114-116. The JYMCI also filled a role as mediator for the various needs of the Japanese community. Responding to the members’ strong interest, the JYMCI reading room came to hold more than one thousand books in addition to dozens of periodicals in both Japanese and English, which welcomed a daily average of 45 Japanese men. By the mid-1920s, the library and reading room came to hold more than three thousand books in both English and Japanese, which could be checked out by the members for free. While these activities promoted frequent interactions among Japanese young men—and occasionally, Japanese women—in Chicago and maintained a social and cultural tie between Japanese Chicagoans and their homeland, it is its monthly bulletins that seemed especially effective as a way to expand the boundaries of the community. 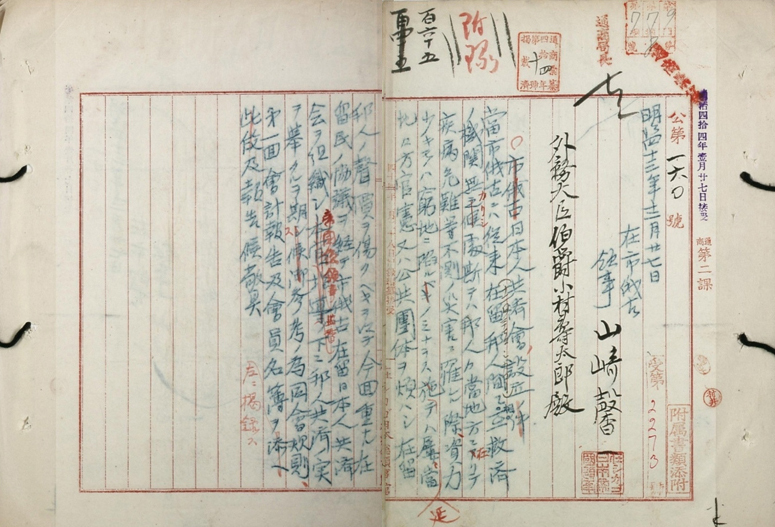 Five hundred copies of the bulletin, Kwai-Yu, which means “Friends of the Organization”, were printed and distributed to Japanese living both inside and outside Chicago, and were intended to provide countrymen with the news and information that they desperately needed for living in a foreign land. JYMCI building purchased in 1918 at 745-747-749 East 36th Street. From the article “Rev. Misaki Shimadzu of Chicago,” by Katsuji Kato, in The Japanese Student, January 1919, (Chicago: George Banta Publishing Company, 1919), 129-131. 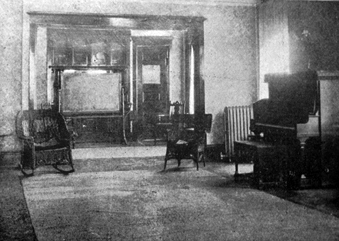 View of the living room of the JYMCI. From Misaki Shimadzu, The Visitor’s List (Tokyo: Nihon Kirisuto Kyokai, 1932). As the physical space of the Institute slowly increased, so too did the number of activities for participants. Sunday meetings averaged twenty-eight people in the morning and forty people at night. A Wednesday prayer meeting attracted an average of twelve people. The literary society continued to be popular among the members, with speakers from the humanities and the sciences, as well as those interested in religion. 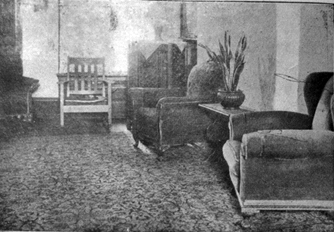 Additional view of the living room of the JYMCI. From Misaki Shimadzu, The Visitor’s List (Tokyo: Nihon Kirisuto Kyokai, 1932). As the membership grew, the JYMCI would eventually affiliate formally with the YMCA as the Japanese department of the YMCA in 1922. The dormitory had forty beds in twenty-six sleeping rooms and the Institute embraced the motto “Home for young men and hospitality to all.” The expense budget in the same report showed more than $2,000 in donations from 169 subscribers— both Japanese and American— for its monthly bulletin. Perhaps because of overly-ambitious programming, or perhaps because of larger changes in views of the Japanese, the Japanese department started to have financial problems in the mid-1920s. There also seemed to be a growing sense of distrust within the YMCA against the Japanese department. Shimadzu’s detailed monthly reports to the YMCA of Chicago described various activities of the institute that attracted Japanese residents in Chicago and responded to their needs. From the collection “YMCA of Metropolitan Chicago,” Chicago History Museum, Box 189, Folder 4, pages 1-3. 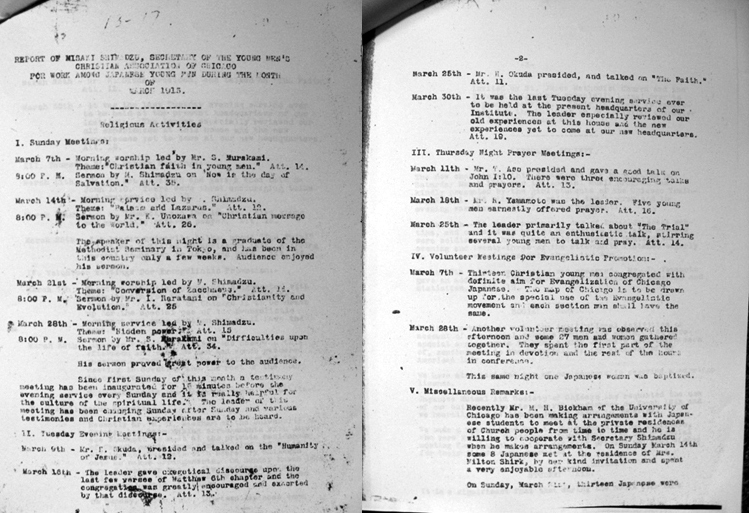 On January 28th, 1929, the YMCA informed the JYMCI of its intention to terminate its affiliation with the Japanese department, starting on February 1st. Without the financial and advisory support of the YMCA, the JYMCI struggled. Particularly after Shimadzu left the city for the Shanghai YMCA in the mid-1930s, the Institute scaled down to merely a Japanese language school. Thankfully, a second Japanese Mutual Aid Society of Chicago would eventually support the remnants of the JYMCI, —the Japanese language school—until World War II began. In retrospect, it is hard to underestimate the value of the JYMCI in early twentieth century Chicago. Lacking a physically defined community, such as a “Little Tokyo” or “Japantown,” the Japanese of Chicago needed an organization like the JYMCI to help them both to find a place in the urban Midwest and to remain connected to their motherland. The JYMCI helped immigrants survive in their early decades in one of the most urbanized, industrialized cities in the U.S., through language classes, lectures, welfare assistance, financial aid, and other activities. Finally, the difficulties experienced by the JYMCI in the mid-1920s reflect the challenge of balancing two identities—one as loyal subjects of the Empire of Japan, and the other as acceptable immigrants in American society. Mayumi Hoshino is a scholar of US and cultural history interested in issues of identity, culture and nationalism among immigrants. She earned her Ph.D. in History at Indiana University-Bloomington with a minor in Jewish Studies. Initially enjoying researching Jewish Americans in New York learning Yiddish, she gradually expanded her interest to include other immigrant groups including her own–Japanese immigrants. Her dissertation, “Strangers in the Heartland: Cultural Identity in Flux, Japanese Americans in Chicago, 1892-1942”, explores the ways in which Japanese who settled in the city viewed themselves (and were viewed by others) in terms of race, ethnicity, and nationalism. She argues that Japanese immigrants continuously redefined their identity in reaction to local, regional, and national political events. Her project aims to produce the first comprehensive history of the Japanese-American community in Chicago from its beginnings through the 1940s. During her dissertation research, she was able to locate various century-old historical documents in both the US and Japan and also enjoyed meeting Japanese descendants in Chicago, who ended up letting her use their family memorabilia in her story. She is very grateful to these individuals for their amazing kindness in offering materials to help her develop her findings. This essay is a condensed portion of the author’s Ph.D. dissertation Strangers in the Heartland: Cultural Identity in Flux, Japanese Americans in Chicago, 1892-1942, completed at Indiana University-Bloomington in 2012. This entry was posted on March 19, 2016 by R Y in Community, Issei, Japantown, Neighborhood, Prewar, Religion and tagged Ada May Krecker, Assimilation, Chicago, Family, First Baptist Church, History, Japanese, Japanese American, Japanese Christian Church of Chicago, Japanese Mutual Aid Society of Chicago, Japanese Women's Club, Japanese Young Men's Christian Institute, Kwai-Yu, Misaki Shimadzu, Nihon Fujin Kwai, Takeda Club, YMCA, Yone Shimadzu.